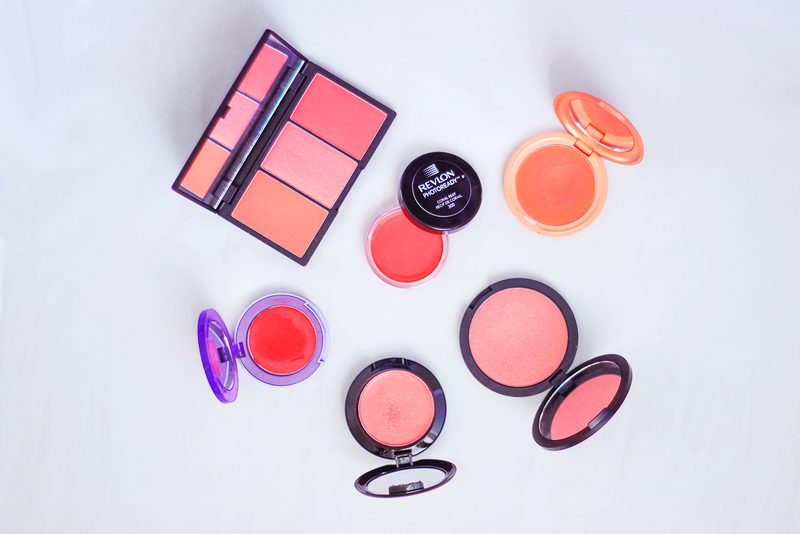 so i may have mentioned once or twice before that i'm OBSESSED with blush, especially orange and coral shades, so i thought i'd put together a post about some of my favourites. i'm just going to jump straight in with number one, the stila convertible colour. after hearing essie rave about it i knew i'd have to buy gladiola first, though i'm really tempted by most of the shades and i know i'll be getting petunia next. it may look bright in the pan but it blends really easily and is just the prettiest shade on the cheeks. even if gladiola doesn't tickle your fancy i'd definitely recommend looking at the rest of the colours because it's a fantastic product. my love for this sleek palette was well documented in my earlier post on the brand and my feelings haven't changed. they're great products, very affordable and super pigmented and i'd definitely recommend them, especially this palette because you get three colours for around the price of two of their individual blushes. i've also mentioned the revlon photoready cream blushes before when talking about the shade flushed, i wrote in that post that i had my eye on coral reef so obviously i've picked it up since then. 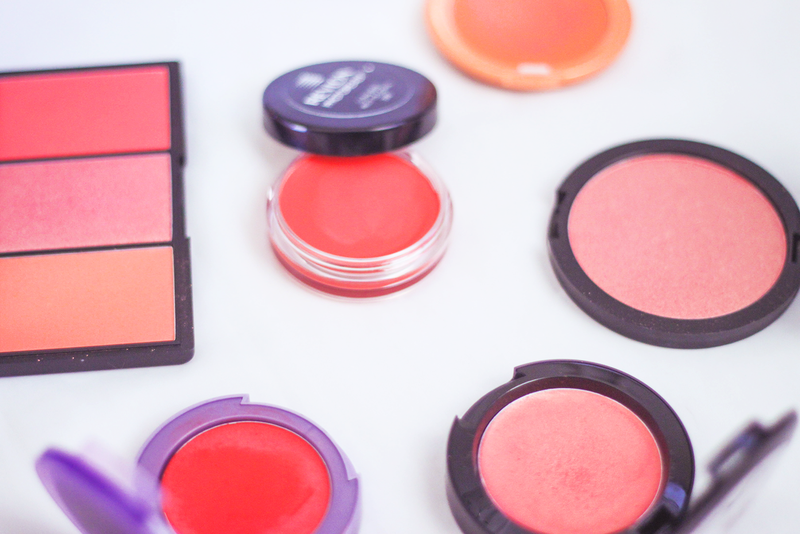 these are great blushes, really smooth and in two really wearable colours. lets just be honest, the urban decay offering looks downright terrifying but you'll be plesantly surprised to hear that it gives a really sheer wash of colour and it's so creamy and easy to blend it would actually be pretty hard to turn yourself into a clown with it (always a plus). it's one of my favourites of the bunch and i think they're discontinued so you can pick it up pretty cheaply online and i wear it all the time. dainty doll formulate all their products with pale girls in mind so this blush is perfect for me, it's a really pretty orangey coral with a gold shimmer running through. now the NYX cream blushes are absolutely something i'd recommend, i love the formula (i have four of them) they're decently pigmented and really easy to blend. tickled is a pretty peachy coral shade but they have a huge range of really wearable colours and, like cream blushes in general, they give a lovely dewey finish. not to mention they're really affordable! i've found cherry culture to be the cheapest place to get them online if they're not available in your country. their shipping isn't super cheap as its calculated by weight but it's worth it, especially when they send out a 20% off code or that time they had a 40% off NYX sale(!) which is when i bought most of my products. What splendidly lovely, juicy, cheerful colours!!! They have the sweetest summertime popsicle vibe to them. I tend to have a tricky time wearing coral and orange when it comes to cosmetics, but am super convinced there must be a coral lipstick out there somewhere that would work me (I just haven't found it yet). I'm really happy to know that my tip for helping brooches stay put will be of use to you, honey. If you can't find the wee elastics in Australia, be sure to let me know and I'll happily pick some up here for you. you're such a doll, thank you! i'm very much a summer person so i think heading into winter just made me more and more obsessed with bright oranges and corals because i was trying to avoid the cold, haha. it must be hard to find one that goes with your red hair but i'm sure you'll find it one day! The sleek blushes look so good - I keep seeing recommendations for them so they are definitely going on my 'wants' list! I've never used the blush. I don't know but I just feel awkward wearing that. I'm in the market for a new blush. I'm glad I read this because I was wondering which NYX blush is good! Quite a selection, I feel like orange and coral shades in most things (be it lipstick...clothes...anything) does not do wonders for my complexion but blush is kind of different, maybe it would work! I like the look of coral lips and things on other people a lot though! i'd never even thought of an orange blush until recently, it just didn't occur to me that they were out there or that they'd look any good on me but i think maybe you'd be surprised! Hi love, your bog is soooo beautiful and I'm so glad I discovered it! 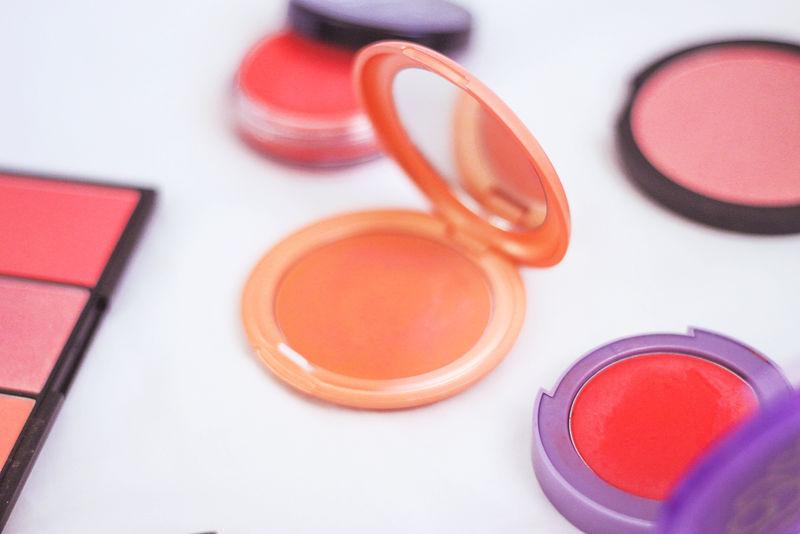 I'm a big blush fan too, but I've never tried any coral shades. You are definitely inspiring me! Another perfect post omg :')) Coral Reef and Petunia are at the top of my wishlist! I have to admit - I haven't quite built up the courage to try an orange cheek as I'm not sure it would suit me. Then again, I thought the same of orange lips and now I really want to inject more of that into my collection. You have made me intrigued, I may have to pick one of these up. I'll probably grab Gladiola when I finally buy the other Stila Convertible Colour I want! definitely go for gladiola, it's such a perfect product! i don't have a single complaint about it. and i'd never even thought orange cheeks were a thing until i just started doing it and i've never looked back. you can definitely pull it off!